This is one of a pair of Russian Gardner Porcelain teacups I found dusty and unloved in a local antique shop. Here is a view of the cups. You can see more of the Chinese figures floating across the sufrace. 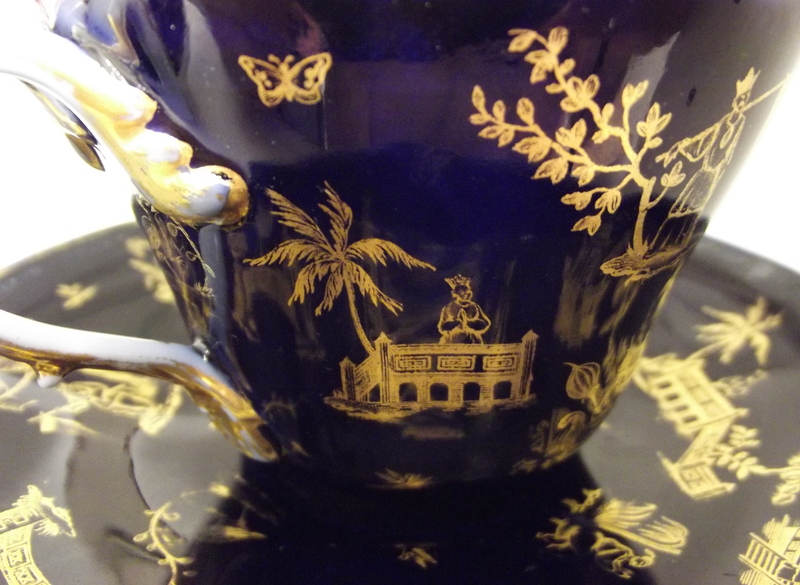 This is a closeup view of a Gardner porcelain teacup form the 19th century. 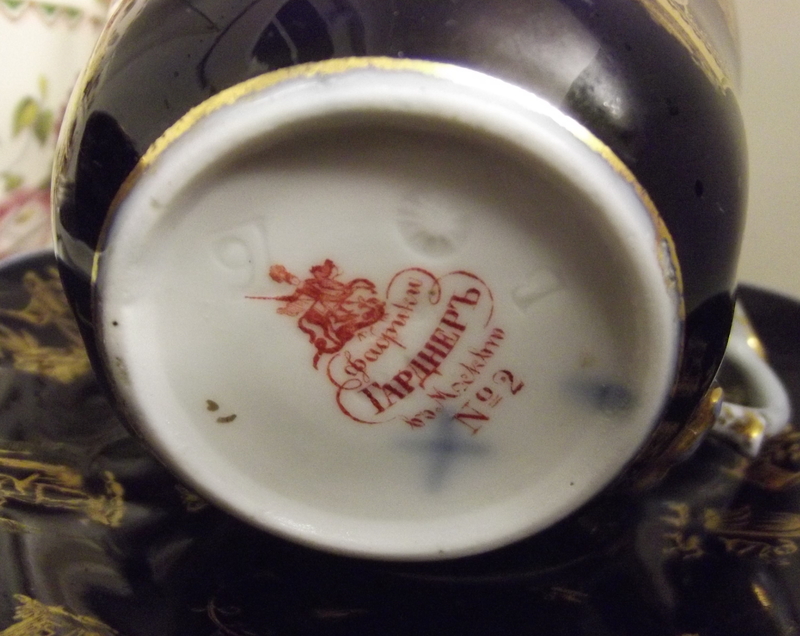 Within this one cup lies so much of the world, for Francis Gardner, an English business man founded the factory in 1766 after being granted a permit to be the first private manufacturer of porcelain in Russia. He employed an Expert from Germany to train the Russian decorators who then proceeded to produce porcelain of exquisite quality that showed influence from around the world including England, Prussia, France and China. 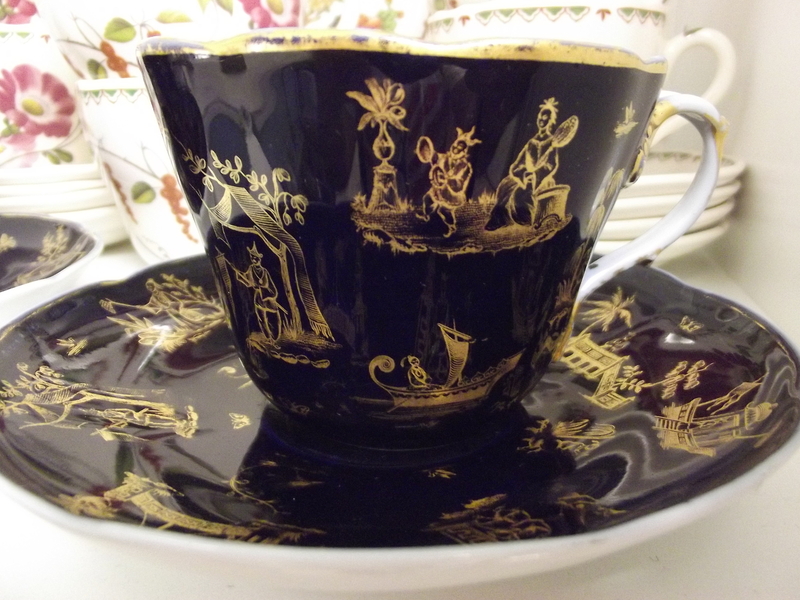 This cup, with its European Rococo inspired shape has been printed with fantasy figures inspired by Chinese scenes. The background in rich cobalt blue has become synonymous with certain types of Russian porcelain but the cobalt used to produce it comes from Persia originally. Naturally the tea, for which the cup was made could have come from China or India. At some point in their lives, these two cups and saucers survived two World Wars and the Russian Revolution, traveled unscathed to the other side of the globe, finally finding themselves in Perth, Western Australia where they now sit in a glass fronted cupboard in my kitchen where I see them every day. Now if this isn’t the world in a tea cup I don’t know what is! This is the mark of Gardner porcelain. It is fascinating that a simple English name like Gardner becomes a wonder when written in Cyrillic.